This easy recipe does not need an electronic mixer, all you need is a hand whisk and rubber spatula to mix the ingredients. As I love Fruit Cake (here) very much I have added more dried mixed fruits, dried cranberries and rum into it to make the cake more flavourful and some natural yoghurt for a softer texture. 1. Mix the mixed fruit and dried cranberries with 1 tbsp rum and set aside for 30 minutes or longer. 2. In a large bowl, mix well melted butter and sugar together then add beaten eggs, natural yoghurt, rum and vanilla extract ~ mix well with a hand whisk. 3. Sieve in self raising flour, mix well and sprinkle some flour onto dried mixed fruit and fold in with a rubber spatula (do not over mix). 4. 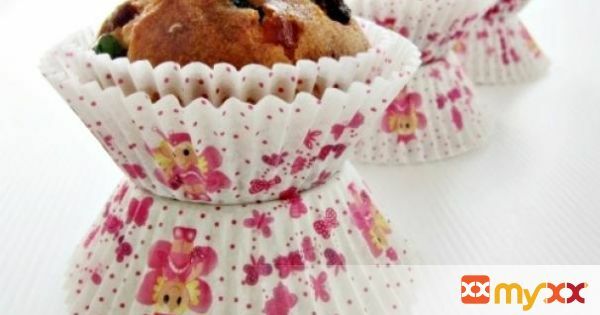 Spoon mixture to muffin cups or liners to 3/4 full and sprinkle extra mixed fruit on top. 5. Bake at preheated oven at 180C for 20-25 mins or skewer inserted into the centre comes out clean.